In line with the energy and resources conservation scheme of the company, GQWEST Inc, the country's premiere water franchising enterprise has taken another step towards greening its operations by installing resource conservation methods in its Superstore. As part of its Green Mindset Program the company installed solar panels and a system of underground and overhead cisterns to reduce its resource consumption. 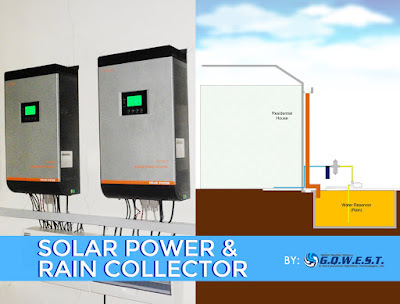 The company's Superstore located in Lincoln street Quezon City is its industrial grade water station that caters to its institutional clients like SM malls and Globe Telecom. The solar panels installed will allow the company to reduce its electrical consumption. At the same time, the cisterns installed will store rainwater and help reduce water consumption and eliminate wastage. The company expects to benefit from these twin measures as it seeks to pair environmental sustainability and greater operational efficiency. Since it began operations, the company has been committed to reducing its carbon footprint through its Green Mindset Program. Apart from its latest initiatives the company has also been a longtime supporter of environmental NGO's like Haribon having regularly participated with the group's tree planting program.